This is where I will put my embroidery patterns formerly resident on wiseNeedle, links to patterns hidden away in String-or-Nothing’s past posts, plus some other freebies from my notebooks. You’ll also find more stitching patterns under the “My Books” button above, including the free offering Ensamplario Atlantio: Being a Collection of Filling Patterns Suitable for Blackwork Embroidery. As with the other incomplete pages on this site, please have patience. Reformatting and porting over 8+ years of material takes time! Plain block unit graphs also appear in the embroidery pattern section. They work well for counted embroidery including cross stitch and its variants; lacis; darned net, drawn or pulled thread work; withdrawn thread work; filet crochet; knitting and double knitting; tiles and mosaics, marquetry, and other crafts. My redaction of an late 16th/early 17th century graphed pattern, charted from an extant museum artifact. I explain source and dedication to SCA Clan Oldcastle in this post from February 2010. I included this Sibmacher 1597 pattern in The New Carolingian Modelbook. Shortly after the first Harry Potter book became available in the US (and long before the movies), I released it in case folk wanted to knit Gryffindor sweaters as they are described in the book. Needless to say, it earned me some unwelcome attention later on, so it’s been retitled with a more generic name. Another The New Carolingian Modelbook excerpt. This one was charted up from a pattern appearing in Domenico Da Sera’s 1546 Opera Nova… You can find that entire work at Kathryn Goodwyn’s Flowers of the Needle.The astute will notice that I’ve used this pattern here twice. Once embroidered and once knit, in the Knot a Hat earwarmer band appearing on my knitting patterns page. Also from the Da Sera 1546 work referenced above, this pattern is included in The New Carolingian Modelbook, too. Like the lion above, this hare is from Johan Sibmacher’s Schon Neues Modelbuch of 1597. It appeared in The New Carolingian Modelbook. I’ve used it both in stitching and knitting, although those projects predated on-line documentation. The basic interlace that started this rumination was published in Giovani Andrea Vavasore’s Ensamplio di Lavori, first printed in Venice in 1532. I regraphed that pattern and included it in The New Carolingian Modelbook. Since then I’ve played with it, abstracting bits and compounding the base concept. This one’s original, but it was inspired by patterns appearing in in Niccolo Zoppino d’Aristotle’s Ensamplio di Lavori from 1530. It’s anotherThe New Carolingian Modelbook excerpt. Another original pattern, but one by Elder Daughter Alex rather than me. Inspired by a yale (a heraldic splay-horned goat) appearing in various Sibmacher modelbooks of the late 1500s/early 1600s, she’s come up with a unicorn. She uses it for knitting, but it’s equally useful for stitching. Yet another of my own. I worked up this motif for a needlepoint bench cover my mom was going to make. But I’m a rotten kid, and I never finished out her design. I’m not quite sure where I got this one. It’s in my 1980s notebook, next to sourced patterns that made it into The New Carolingian Modelbook, but with no annotations. There are lots of examples of this type of interlace in historical works, but none graphed up at exactly this unit count. I suspect I doodled it up, inspired by the historical examples. I’ve used it for double knitting, but (so far) not stitching. I couldn’t resist. 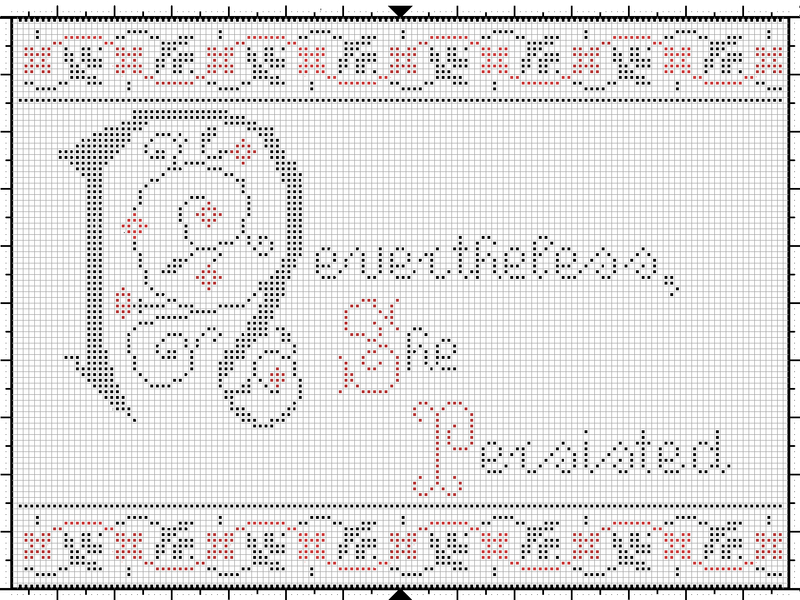 It was such a perfect motto for a sampler, and the irony of using an art form that requires persistence to accomplish, made perfect sense. This one was released on 10 February 2017, via Facebook and Tumblr, without any name attribution or copyright note, to be free for anyone to complete. I would love to see the end result, and will post pix of any finished items here on String, with the stitcher’s consent. These patterns can be used for double running stitch embroidery (aka Holbein Stitch, Spanish Stitch, punto scritto), back stitch, or other linear techniques. An original inhabited fill pattern, inspired by Elizabethan era counted fills, but perhaps a bit more exuberant. This pattern page appeared in my book The New Carolingian Modelbook, and is dedicated to the residents of The Buttery. Another original pattern, done up for a sampler stitched for Elder Daughter. You can never have too many mythical beasts! A modern mythical beast. This time, challenged to render Noodly Glory, I came up with this rendering of The Flying Spaghetti Monster. Just for fun – I present a pattern that did NOT make it into my formal publications. This one was done up as a silly present with several constituencies in mind – my eldest, who wanted more pirate skulls; a co-worker who cherishes the octopus as his totem beast; and my youngest, who has embarked on a world-wide quest for greater acceptance of “octopodes” as the proper plural when more than one cephalopod is sighted. This pattern is adapted from a photo of a coif and forehead cloth, dated 1600-1620 in the collections of the Manchester Art Gallery. You can find a photo at http://www.manchestergalleries.org/the-collections/search-the-collection/ by searching for item #2003.63/2. It is hard to discern on the original the exact nature of the little spot to the lower right of each flower. It may be the remains of a diamond shaped boxed cross, or four knot stitches. If I were to do a coif using this design, I’d probably sew a sequin in each of those spots instead. Yet another New Carolingian Modelbook refugee. This border with corner is an elaboration on a design there, pairing it with a narrow edging. It’s an original, inspired by simple stepped design strips appearing in German modelbooks of the mid 1520s. Finally! Our group project from Summer 2011. 40 different motifs in a framework, contributed by String-or-Nothing’s readers. This pattern is suitable for use as an all-over design. Use all 40, or a subset. Groups include traditional motifs, flowers, nautical/piratical, science fiction/fantasy, astronomy, and beasts & bugs. Authors’ names have been included, where they so requested. Hello- some minutes ago I found in Mary Corbeth’s blog the link to these wonderful blackwork-patterns. It is really great, to see so much possibilities- as everybody knows who gets in contact with blackwork- one is addicted at once! I embroidered a renaissance-smock with blackwork and have in work two Tudor-sleeves (long lasting history…) thank you very much for giving these patterns for free! I too found you via Mary Corbeth’s blog…. thank you for the blackwork book – it looks too delicious for words! Thank you for putting these on the Web. I just couldnt beleave my eyes. I love blackwork, I want to thank you so much for your knowledge,and the willness to share. Found you through Mary Corbeth’s blog. I shall study and use your patterns for a dress I have been plaining. I found you, interestingly enough, on Pinterest. Can’t tell you who posted, but I am thrilled to have found you. I would also like to that you for your generosity in sharing your considerable talent. These designs are stunning! I found your site by luck. The patterns are stunning and just what I need to make the ring pillow for my son’s wedding. I can’t thank you enough for sharing your skills. Mary Corbett has a lot of followers! Thank you for sharing so much of yourself, too. I found your celtic knotwork Italian c1530-40 sampler on Carol Hanson’s Dragonbear.com website (http://www.dragonbear.com/sample3.html). I would like to adapt the pattern to make a double-sided/reversible knitted blanket for a work colleague (and to show at the Royal Canberra Show in 2015). Similar to the Persian Tile Wrap I did in 2013 (http://www.ravelry.com/projects/LinMSmith/persian-tiles-2). The design on the website has been copyrighted. Can you let me know if I am able to use it for non-commercial means. Hi Linda! Please feel free to go ahead and use that particular design. For the record, I originally published it in a leaflet long out of print: Counted Thread Patterns from Before 1600, Black Rose Press, 1986. If you issue documentation or post on Ravelry, I’d greatly appreciate it though if you could include a link to http://string-or-nothing.com in your write-up. Thanks for asking! Delighted you like the design – K.
Thanks. I have put a link on my project page (http://www.ravelry.com/projects/LinMSmith/2014-celtic-knot-reversible-blanket). I will update the page regularly and post pictures every now and then, if you wanted to keep an eye on how it turns out. Beautiful! Thanks so much. I wish you could make a filet crochet pattern for the Flying Spaghetti Monster.